It depends on who you get however the lady who I considered to be the best (Aileen) has gone to Thailand so I shall not be returning. Having been quite a few times there are therapists that try to talk throughout the whole massage which is counter objective when you go to unwind. Also nearly every time I've been there someone has come into the room to talk to the therapist mid massage or therapists not telling load customers to be quiet. These small things can ruin this kind of business as each customer counts. Went there with sore neck, calves and shoulders and had the Thai deep tissue massage. The pressure was very firm but that is how i prefer it and i genuinely feel so much better. I am female and felt relaxed and safe. Very reasonable price too. Only down side is the street noise which can not be avoided as it's on the high street. I will definitely be going back. The staff were all friendly and professional. 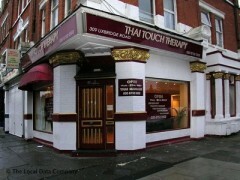 Best Thai massage I have had. Friendly, v experienced staff. They have helped me a lot with injuries and posture. There is a range of strengths in massage given from light to strong. They are doing the place up as well to make it nicer. I am a female and I have been coming for massage to this place for several years. The place started with very modest interior and is getting better and cosier nearly every time I visit. I have very good experience with the therapists. They are polite, attentive and gentle but very strong and fit. They usually speak just basic English but no talking is required as their hands speak for themselves. I have invited my friends and family members and some of them did, or are planning to, come back despite living on the other side of London.